Okay, okay… I know that the title of today’s post is actually a command and not a question (and that the question mark, therefore, is totally unnecessary) but doesn’t it look weird without? At any rate, I apologize for the tardiness of today’s post. The internet was down at Casa Richter again, which means my plans to start writing about the things I’d really like to write about were foiled once again. Nonetheless, I was amused to stumble upon this blog post written by one of the ethnomusicologists I met at the CORD/SEM conference back in November (the cute one, who just so happened to introduce himself as a relationship columnist). I liked his post for two reasons, firstly because a good portion of it was about me and I’m nothing if not egocentric. Secondly, and perhaps more importantly, it articulated, rather eloquently, what I’ve been feeling for a while now. I can’t write about dating for the rest of my life. And I never set out to write about dating in the first place. I want to write about people. And places. And even though I’m too busy trying to be The World’s Greatest Teacher right now to become The World’s Greatest Travel Writer, I’d like to practice a little. So I hope you’ll indulge me. Tomorrow something about that picture. First person to guess its location wins… I don’t know… something. Maybe a “Team Wedding Date” t-shirt. Heading North for Spring Break? Think Again! Y’know the one, right? It’s outside for Pete’s sake! Woohoo! I’m back to being the first commenter again. Yay for small, insignificant nothings! Haha, whatever floats your boat 🙂 Although you are unfortunately incorrect! That’s outside the art museum, right? With the Rocky statue? I drove past it once on my way to my sister’s place in Manyunk (did I even spell that right?). Good guess– you’re on the right track with the museum bit, but it’s not Philadelphia! is it outside the National Gallery of Art, Washington, DC. It kind of looks like it. M stumped,… Not the UK, (cars are parked on the right side of the street) Hill in background says not philly, not DC, not likely Baltimore…. Gotta give it some thought. knowing the other two in the pic, it has to be 3 or 4 years ago. Was it a Spring break trip that included Canadia, (when most go to FL or Cancun) was the pic taken by “redrican”? Canada, on that road trip u took with Sarah and someone else? 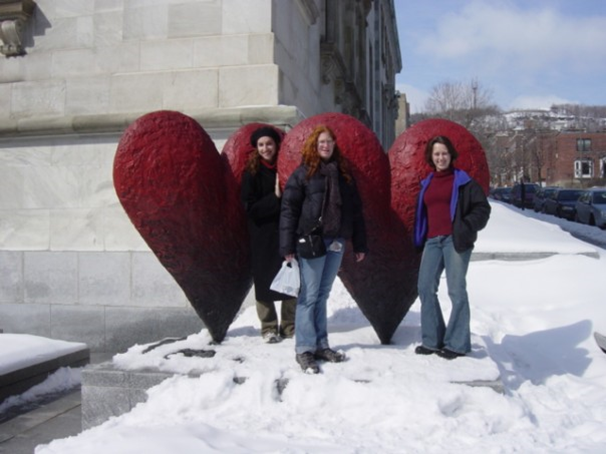 Two red hearts outside the Musee des Beaux Arts on rue Sherbrooke. Haha– you don’t know how tempted I am to post that photo of us drinking sangria in our “clubbing outfits” (what was i THINKING with that leather fringe jacket and the psuedo-Alicia Keys hair?) but it seemed just cruel– lol! Yeah, I was thinking about that… not all family members are as discreet as others.